Musical Theatre News: Sheila Hancock and Jenna Russell in Grey Gardens Musical? Sheila Hancock and Jenna Russell in Grey Gardens Musical? 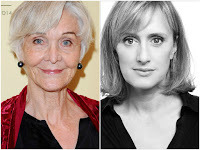 According to today's Daily Mail's, West End leading ladies Sheila Hancock and Jenna Russell are in discussions about the possibility of starring in the musical Grey Gardens which will be directed by Thom Southerland at the Southwark Playhouse early next year. The triple Tony-winning project debuted on Broadway in 2006, starring Christine Ebersole, Mary Louise Wilson and Erin Davie. The show is based on the 1975 documentary by Albert and David Maysles about the lives of Edith Ewing Bouvier Beale and her daughter Edith Bouvier Beale. It delves into the quirky daily life of the two women living in their nearly derelict mansion in East Hampton, Long Island following the eccentric Big Edie and Little Edie on their funny and heartbreaking journey from glamorous aristocrats to notorious recluses in a crumbling house filled with memories and cats. Hancock and Russell sound like inspired casting! The musical has a book by Doug Wright, music by Scott Frankel and lyrics by Michael Korie. Hancock's recent theatre credits include Sister Act The Musical (Palladium) and Barking in Essex (Wyndham's), whilst Russell's include Di & Viv & Rose (Vaudeville), Urinetown (St James/Apollo) and Merrily We Roll Along (Menier/Harold Pinter).